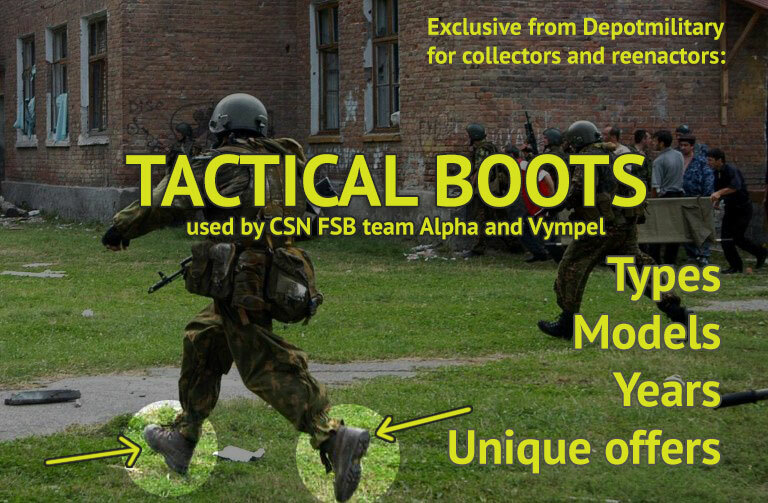 Till this time there was no expert article regarding boots used by Alpha and Vympel counter-terrorist unit of CSN FSB. In this article we eliminate this white spot. This review will primarily be devoted to the reenactors of the russian elite counter-terrorist unit teams - CSN of FSB (Center of Special Purpose of Federal Security Service of Russia) - the Vympel and Alfa groups, from 2000 years to the present times! There are a lot of information on various uniform, arms, equipment and armor regarding this unit on various resources, but very little information about boots! If the uniform or armor vests can be easy determinated from the photo, understanding of shoes which were worn on a soldier in a certain period is a very big problem! First of all, because the shoes in the photo are always smaller in size, very hard to see model or trade mark, shoes often are in the mud or wet, then to understand the manufacturer's firm does not seem possible at all.You can tell us that shoes are not so important for reconstruction - maybe not, but if you want a maximum coincidence and feelings in a certain event, then shoes like any other equipment attribute - must be also exactly correspond the boots that was weared on the unit members! Like any state structure of the CSN, the FSB of the Russian Federation is contractually buying footwear for its employees and they usually try to buy best footwear on market. Since in Russia footwear is not so good, mainly CSN buy imported footwear. But now wome manufacturers in Russia, such as "Faraday", if you look closely, subsequently copied some models of shoes from foreign manufacturers.And this boots are also good (and cheaper). First, we will list those companies, that have officially supplied footwear for CSN FSB under the state contract. The list will be placed approximately in percentage terms (the number of shoes by firms manufacturers) from top to bottom in descending order of purchasing shoes. Also we add a years, when this boots was supplied. Below are links to shoes with photos of team members of the CSN FSB and examples of this particular shoe that served in Alfa and Vympel. This boots (1-3) constituted the majority (70%) of boots in CSN in this years. We will add more photos to this article when will list more boots in our website. You may ask, how do we know it and can you trust this list - we answer, that this boots is actually boots used in CSN unit. We have in in stock and officially can sell it as surplus. All listed boots was owned by Alpha and Vympel team members and we offer it after planned exchanging to new. All boots are professionally cleaned and serviced, shoelaces are changed to new. We have all sizes and models. Actually this boots you can see in photos from historical and dramatical counter-terrorist operations, like Nord-Ost Moscow Theater, Beslah School Hostage Crysis and other situations.